Meredith College is going strong in many ways: Our 22,000 graduates who are going strong across the country and around the world. Our smart students who are engaged in research, community-based learning, studying abroad and preparing to make a difference in their communities. Our talented faculty and staff who make Meredith College stronger every day with their unwavering commitment to Meredith's mission. All going strong. Is among the “Top 50 Alma Maters of National Board Certified Teachers.” Meredith was the only private institution in North Carolina to make the list, which is compiled by the National Board for Professional Teaching Standards. Named a 2019-20 Military Friendly School. This list honors the colleges, universities and trade schools in the country that are doing the most to embrace America’s military service members, veterans, and spouses as students and ensure their success on campus. Rated number five on the College Choice 2015 Best U.S. Women's Colleges ranking. Meredith scored a 91 in academic reputation, which was the second highest on the list. 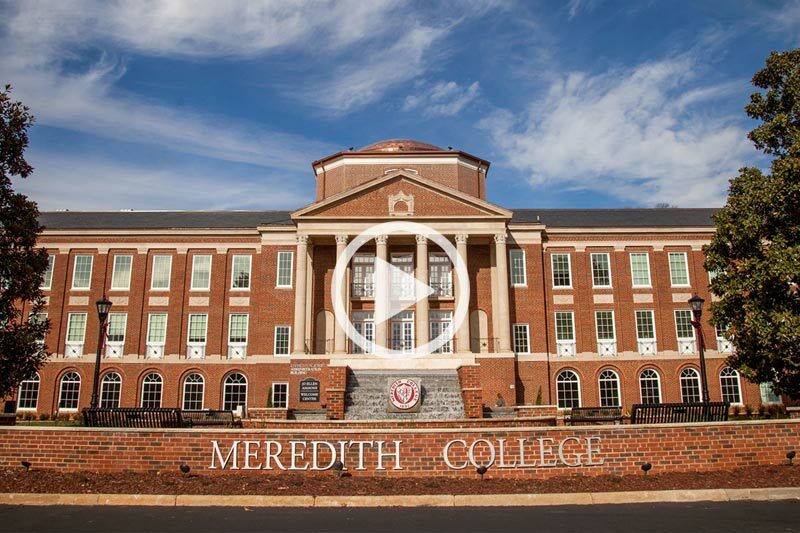 StrongPoints is a defining element of the Meredith College educational experience. Through this unique personal coaching and advising model, students identify their strengths using a research-based assessment tool. Then, throughout their four years at Meredith, they examine how those strengths can help shape their academic goals, experiential involvement, financial planning, and career choice. The result is a stronger college experience - and preparation for a more successful and fulfilled life. 97.7% of students participate in an applied learning experience such as internships, study abroad, or undergraduate research. One of only two women’s colleges in the world that are accredited by AACSB International. Just one third of U.S. business programs and 5% of business programs worldwide are AACSB-accredited. Program accreditation in education, social work, nutrition, music and interior design. Meredith is the only College in the Triangle area whose interior design program is accredited by the Council for Interior Design Accreditation (CIDA). Meredith awarded $24 million in scholarships and grants to students in 2017-18. Over the past five years, 92.2% of graduates are employed or pursuing graduate study within a few short months of graduation. 96% of graduates would choose Meredith again, and 99% would recommend Meredith to others. 98% of Meredith graduates were satisfied with their academic experience, and 97% of recent alumnae say they were professionally well-prepared as a result of their Meredith experience.